...that Saint-14 has not been heard from since he defeated Solkis, Devil Kell and traveled to Mercury to investigate Osiris? ...that Reksis Vahn, the Hangman is responsible for the collapse of the House of Wolves, since he hunted their Servitors? "One sword stands tallest among them, leading the charge against us all." Sardon, Fist of Crota is a Hive Knight encountered in the Fist of Crota Mission from The Dark Below. 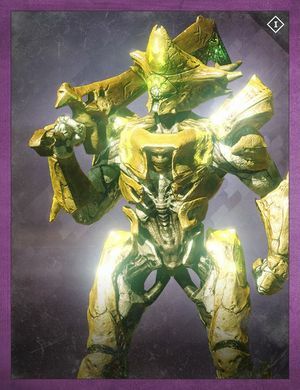 Being a significant member of Crota's forces, Sardon is the leader of the Blades of Crota and commander of all his armies, with the Swarm Princes being his generals. Sardon is one of the most dangerous Knights ever faced by Guardians. Upon spawning, he casts a debuff called "A Dark Burden", which prevents players from using their jump ability, blocks their vision the closer they are to him, and causes damage when at a higher elevation at him. This works in combination with Sardon's preferred method of attack, which is unleashing a shockwave with his sword (the same as using a sword's super attack). This heavily-damaging shockwave travels along the ground and causes disorientation and being launched into the air upon a successful hit. Sardon is also a surprisingly nimble target, making it hard to land sustained fire on him. But once defeated, the Hive form a different plan to secure Crota's power.